Bring the stories of children laboring in the cocoa fields alive this Passover by participating in our Seder Song Lyrics contest! We will award a $180 cash prize to the best original lyrics set to a familiar melody that raises the contemporary Passover story of children enslaved in cocoa fields. Finalists to be chosen by a prominent panel of Jewish singer-songwriters, including Michelle Citrin, Rabbi Menachem Creditor, Cantor Linda Hirschhorn, Si Kahn, Steve Seskin, and Craig Taubman. Entries must be received by Midnight (PDT) on Sunday, March 17. Complete information can be found on our website. We have learned more about the chocolate business than we ever thought possible in our search for finding a producer of Fair Trade Kosher for Passover chocolate! While we can't yet offer you the product, we wanted to let you in on our journey to get there! While we can't yet offer Fair Trade Kosher for Passover chocolate, there are several soy-free Fair Trade options available (depending on one's level of Kashrut observance). Equal Exchange's entire line of chocolate bars (including minis but not candy bars) are lecithin/soy free. Tierra Farms offers a variety of Fair Trade dark chocolate covered fruits and nuts that are also soy/lecithin free. “Virtual” Fair Trade Kosher for Passover Chocolate Bar Now Available! Although we can enjoy Fair Trade chocolate for 51 weeks of the year, it’s ironic that during Passover, when we celebrate our journey from slavery into freedom, there is no Fair Trade Kosher for Passover chocolate available - yet. FTJ is working hard to make this a reality. As a gift for your donation to support our work, you will receive your very own “Virtual” Fair Trade Kosher for Passover chocolate bar that you can place on your Seder plate and draw attention to this issue. 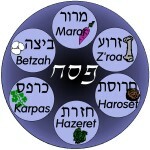 Products purchased by Tuesday, March 19 will arrive before Passover! As we celebrate our people’s freedom during Passover, let us remember that others are still enslaved. 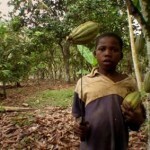 Fair Trade Judaica has developed several readings that you can add to your Haggada during your Passover Seder, focusing on the role of trafficked and enforced child labor in the cocoa fields. 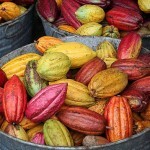 There are photos of cocoa beans that you can download for free and place on your Seder plate, symbolizing that slavery is still, unfortunately, a contemporary issue. Contact information for ordering Fair Trade Kosher chocolate. Come join Fair Trade Judaica at Hazon’s Jewish Food Festival on Sunday, March 17 at the San Francisco JCC. There will be fabulous workshops, great food to eat, and we’ll have a wide variety of Judaica to sell, including our new Passover products from South Africa. FTJ is excited to participate in “Food Justice Passover: Slavery and Liberation, A Thing of the Past or a Modern Dilemma” on Monday April 1 in San Francisco. The event will include rituals, learning and discussion, vegetarian/ethically produced chametz-free Passover dinner and wine. David Lingren, FTJ's Chief Technology Maven, shares his experience (from the other side of the computer) on FTJ's recent trip to Guatemala. You can read his post on our blog. Writing in The Independent, Sarah Morrison gives us a great article on how "small producers face poverty as ever more commodities are controlled by a coterie of multinationals." 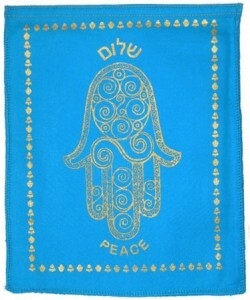 Celebrate the holiday of freedom and liberation with Fair Trade Judaica’s beautiful and inspiring Jewish Blessing Flags! We have just received a new shipment from Nepal. Give the gift of blessings to someone you care about. Designed by Fair Trade Judaica, the banner is composed of seven individual flags, each reflecting a key Jewish value. 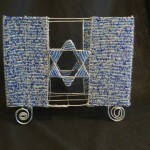 Copyright © 2007-2013 Fair Trade Judaica, all rights reserved.